Length: 6 hrs. 38 min. “Jesus is the answer.”“God has a perfect plan for your life.”“All sins are equal.”Sayings like these may make catchy bumper stickers, but as deep, life-changing truths they fall short. They are the earmarks of “folk religion”—a badly distorted pop-Christianity that thrives on clichés and slogans and resists reflection and examination. 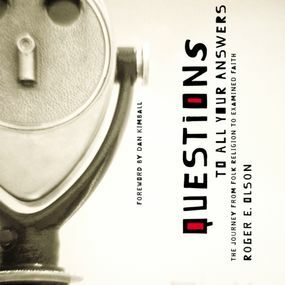 Such pat spiritual answers often contain a nugget of truth, but that truth is easily misunderstood and misapplied in ways that do more harm than good.Roger Olson encourages us to reach for a higher and deeper faith. Examining ten prevalent Christian beliefs, he raises questions that encourage us to engage our minds with the Scriptures in order to carefully consider what it is we believe and why. You’ll be surprised at what you find. Questions to All Your Answers will help you use the God-given gift of your intellect to sift through glib sayings that sound right to what actually is right—to truth that really can set you and others free.